Salmon brings people together, whether it's around a beach fire under the Alaskan midnight sun or around a table with family or friends anywhere in the world. One of the things we enjoy about sharing our salmon in Minneapolis is getting to meet and interact with such enthusiastic, curious, and appreciative salmon fans. At a variety of markets, we learn and share ideas not only with passersby and customers but also our fellow local vendors. Recently we met Tasya of Isadore Nut Co, fell in love with their mouth watering nut mixes, and snagged a wonderful new recipe to try which we made last night. If you crave healthy, sustainably sourced nuts as we do, this recipe will be one to keep. 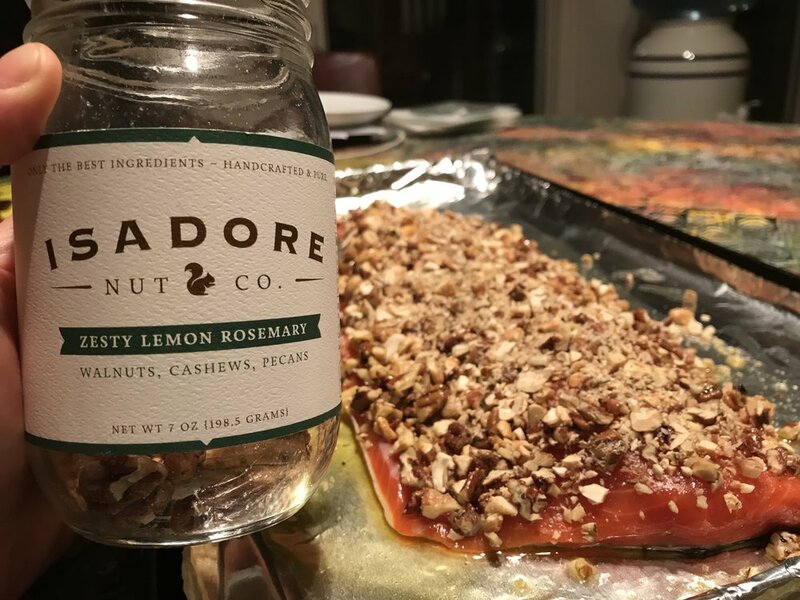 Find Isadore Nut Co here - and read on for our rendition of their Zesty Lemon Rosemary Salmon. First, preheat your oven to 375 degrees. 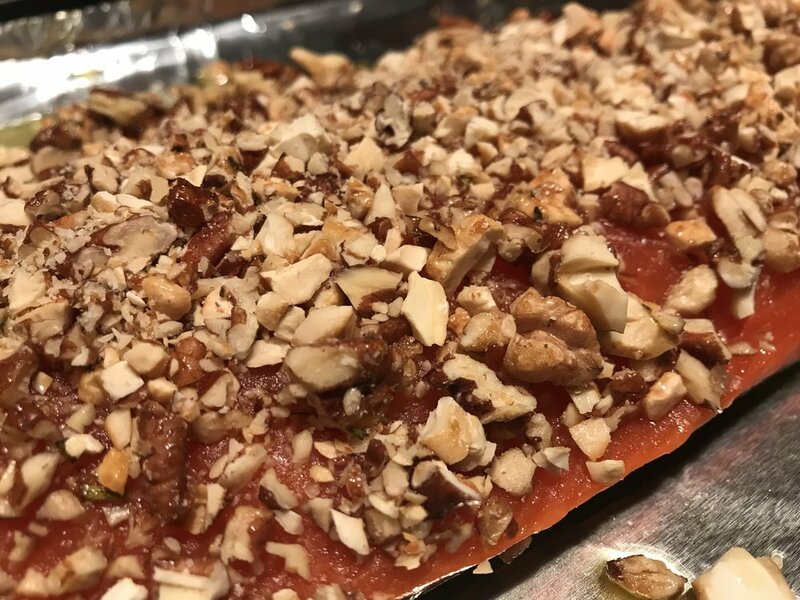 Then place a thawed wild Alaska sockeye salmon fillet on a baking sheet lined with foil for easy cleanup, and cover with extra virgin olive oil. Crush up Isadore Nut Co. Zesty Lemon Rosemary nut mix, and spread on top of fillet, pressing lightly to make the nuts stay in place. Let sit for 30 minutes on top of the fillet to allow the flavors time to develop. 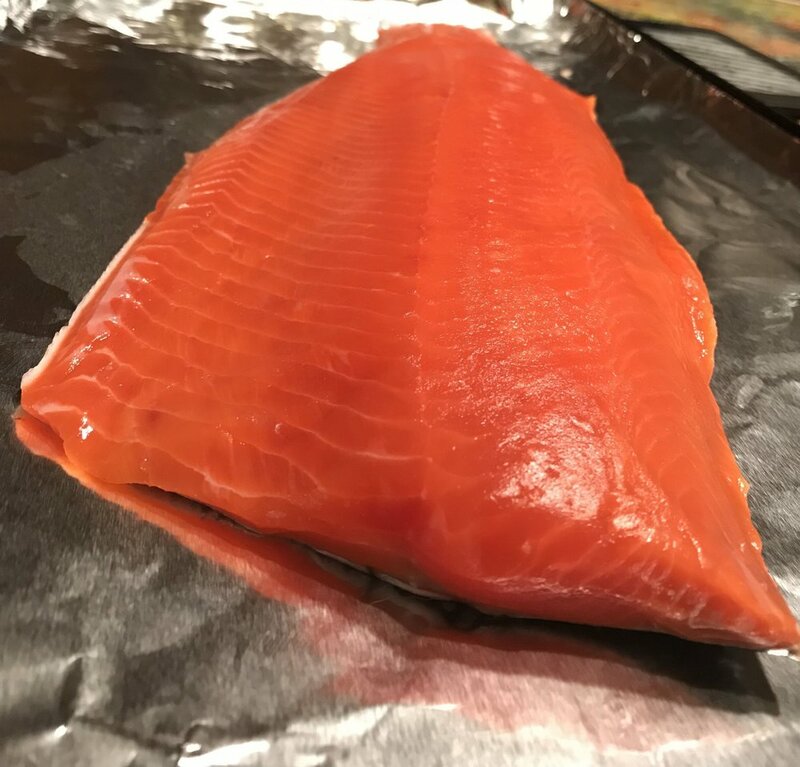 Then bake for 22 minutes, or until salmon flakes with a fork and is just barely not translucent (ovens do vary so check at 20 min). Enjoy! 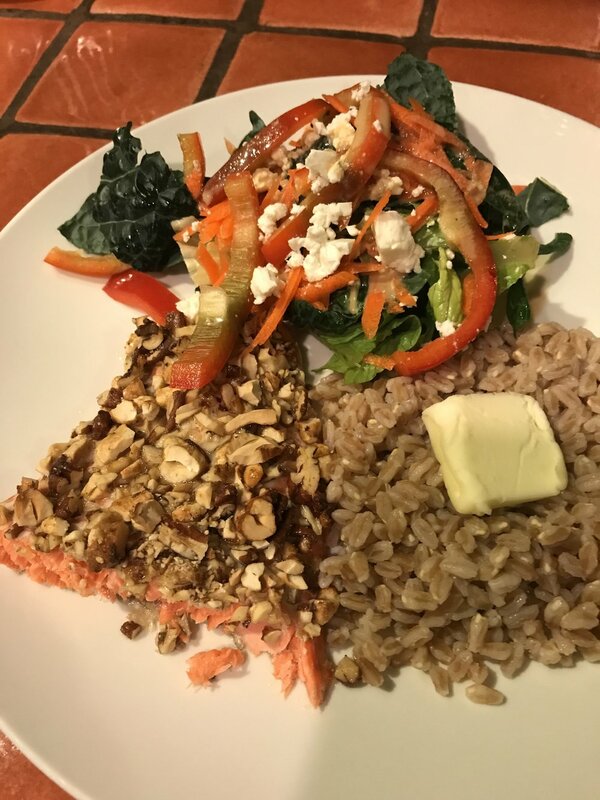 To accompany our dinner, we cooked up a little of the ancient grain farro. From being called "Pharaoh's wheat" in Egypt to being a staple in the Roman empire, this is a nutritious grain with more fiber than quinoa, and chock full of B vitamins, zinc, iron and some protein. Its texture is more complex than rice and has a nice nutty mild flavor. To round out our meal with dark leafy greens, we harvested some cold hardy dinosaur (Tuscan) kale 30 feet from the front door. Sure, it's droopy this time of year, but it perks up some in the 'fridge wrapped in a damp paper towel. Our salad was also composed of a delicious Faribault farmer's market sourced bell pepper and Minnesota grown carrots. As they say, Bon Appetit. Thank you so much, Tasya, for bringing this new recipe into our lives. We really enjoyed it!